Recently, the Supreme Court of Canada over-turned a 22 year ban on physician assisted suicide for patients with grievous and irremediable medical conditions. The unanimous decision gives provincial legislatures a year to enact new laws. According to recent polls, 85% of Canadians agree with the "dying with dignity" position and we can expect much emotional debate on the subject in the coming months. 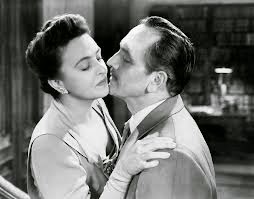 The 1948 film An Act of Murder tackles the subject of euthanasia and is well worth watching for its ideas and performances. Fredric March stars as Judge Calvin Cooke, at work a stern magistrate whose view is entirely black and white. He holds no room for the grey area of human frailty and emotions in terms of meting out justice. At home, Calvin Cooke is a devoted family man, who adores his wife of 20 years and their daughter. Florence Eldridge plays the patiently loving Catherine Cooke. Geraldine Brooks is Ellie Cooke, a young law student romantically involved with David Douglas played by Edmond O'Brien. Douglas is devoted to his clients and a strong believer in humanizing the courts. Judge Cooke sees the younger man as a firebrand and does not take kindly to his interest in Ellie. Soon, Calvin's mind will have other, more pressing worries. Stanley Ridges plays close family friend Dr. Walter Morrison. Catherine confides in this former beau that she has been suffering from headaches and blurred vision and quietly requests a check-up. Catherine has an inoperable brain tumor and her friend and physician instead of revealing the news to her shares the diagnosis with her husband. He explains the course of the disease and urges Calvin to keep the news from Catherine as there is nothing they can do except try to relieve some of her pain. Perhaps, in some cases, this deception would be warranted despite the lie to the patient and the strain on the relatives. Personally, I feel each patient has the right to full disclosure and in Catherine's case, the intended kindness is in reality quite cruel. Miss Eldridge is exquisite in the role of Catherine Cooke. Her affection for her family and the subtle ways she cares for them is charming in the early part of the story. Her fear for her health and confused relief after the check-up make the viewer ache for her plight. Catherine's complete joy when Calvin reverses his plans to take her on a long-awaited second honeymoon is almost girlish. Her realization that her illness is not abating and the knowledge that attends it, raising doubts and fears and panic is heart-rending. Now Catherine is in on the deception and the support so desperately needed is denied her. Calvin is deeply troubled as the extent of Catherine's suffering places in his mind the extreme possibility of ending her pain. Only in the thought of comforting his beloved wife would the judge deliberately move outside of the law by which he has lived. March makes the conflict live and breathe. I cannot speak to the original story The Mill of the Gods by Ernest Lothar, but it is from this point in the story that the screenplay by Michael Blankfort and Robert Theoren struggles to maintain its original integrity, although still dramatically intriguing and sincerely performed by the leading players. Judge Cooke is arrested for the murder of Catherine and is defended by David Douglas. During the courtroom sequence, the movie becomes more of a puzzle mystery in its attempt to find its way out of a thorny subject. It was brave of Universal at this time nearly 70 years ago to approach such a controversial matter, but bravery and box office concerns don't always go hand-in-hand. Director Michael Gordon does have a masterful way with dramatic material and actors. An Act of Murder is among his most watchable films including Another Part of the Forest (also with March and O'Brien), Cyrano de Bergerac, I Can Get It for You Wholesale and the 1960s comedies Pillow Talk and Boys Night Out. 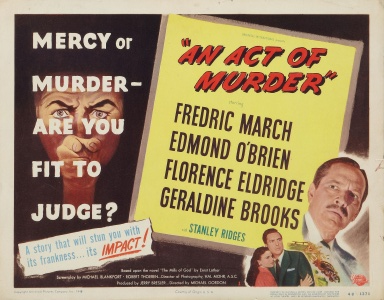 TCM is screening An Act of Murder on Saturday, March 7th at 8:00 a.m. When I wrote about the movie DARK VICTORY, I addressed similar issues, specifically the right to die and who gets to decide when it's someone's time. I had said that VICTORY gave a perhaps-unintentional glamor to dying young, or at least before one's time. This sounds like a very different movie from that. The heiress in "Dark Victory" is rather removed from everyday folks. Florence Eldridge's character in "An Act of Murder" is a somewhat more familiar type. Always a dependable actress, in this role she made me feel her physical and emotional pain. This is a very intriguing movie and you can't go wrong with March and Eldridge. It's been some years since I've seen it, and I'll look forward to it. It was a particular favourite of my late Dad's. He and his dad were big on March. I saw it for the first time last year and was very touched by the performances of our leads. It's an interesting film especially given the era in which it was made (and, as you point out, by a mainstream studio and a famous star). I haven't seen it in years, so I'll be checking it out this month. I wouldn't consider it early Saturday morning fare, but who am I to argue with TCM? I hope you find the reviewing elucidating. Sometimes we're later than we think, but in this case you are getting in under the wire. Becky, if you can connect with TCM Saturday morning, you can revel in Florence Eldredge's wonderful performance. PS: I'm glad you're here. You can visit any time.